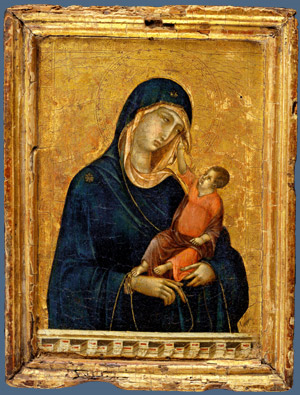 This gesture of the Christ Child is by no means universal – eastern icons, for example, often have the Child in a rather more formal pose, often issuing a blessing – but it is a strong theme especially in Italy. So, what, if anything, does this mean? 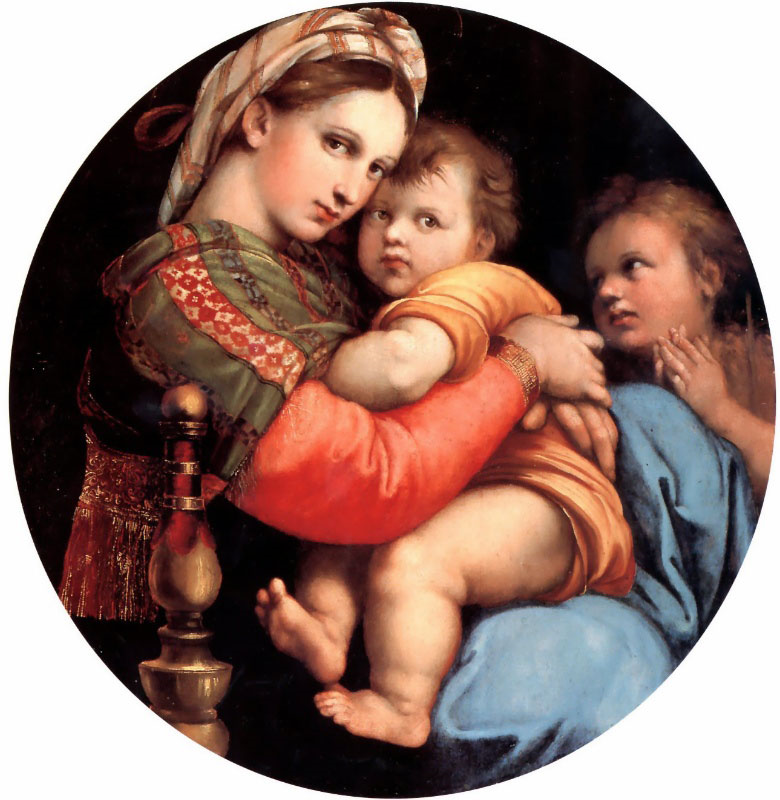 It is tempting to think that the Italians, among whom arose around 1300 the new emphasis on realism that characterizes the Renaissance, were just grabbing a typical baby thing to do – grab any and everything within reach – and putting it into their representations of the Christ Child for no other reason than to add a touch of human warmth. And that’s definitely part of the story. But babies do all sorts of cute things, they will grab your nose, ears or lips, try to shove their hands into your mouth, lunge, stand up, and so on – babies are just darn cute and uninhibited. 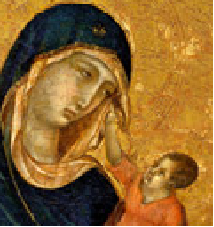 So, at the very least, the artists were choosing a somewhat dignified baby-gesture. After all, it was a church or pious noble forking over the cash for the picture, and they have certain expectations of decorum. This is also a recurring theme. Preserving the dignity of our Blessed Mother and the Child Jesus didn’t really seem to be a mandatory, at least to our sense dignity. So what is going on here? Let’s put all this art in context: first, when looking at ancient art, you’ll be led seriously astray if you carelessly apply our modern aesthetic rules of thumb. Something played out in nurseries all over America – ‘blue is for boys, pink is for girls’ – would make no sense to artists several centuries and thousands of miles removed from us. Christian iconography demanded, at least up to well into the 15th century, that blue was a feminine color, and red a masculine color. While the color rose had its uses, pink was a little dubious – you won’t find much real pink used prominently in painting prior to around 1600. Symbolism is what it’s all about. It was only a few centuries ago that every self-respecting kingdom on earth had sumptuary laws that regulated what people could wear, and under which someone could be punished for wearing colors not appropriate to their social rank or class. Heraldic symbols told people who you were and what you were about without the use of words. And, in art, rules grew up around how God, Jesus, and the saints were to be portrayed. This needn’t be understood as restrictive or oppressive – rather, it permitted communication across languages and education levels. Mary is dressed in red – a male, powerful, nearly divine color – which is almost entirely hidden by her midnight blue cloak – receptive, quiet, humble like the night. The Christ Child, giving a blessing, is also wearing red, only thinly covered in a translucent brown cloak – brown being of course an earthly, non-divine color. Red is also used freely for the saints and angels. The whole image is set on a gold field – gold for royalty. All of the above would have been instantly clear to any medieval church goer. Note that, with one slight variation, Giotto follows exactly the same conventions Cimabue follows. The variation is that he shows the Virgin wearing a white gown with gold trim, and gives a subtle flash of red lining to her blue cloak. 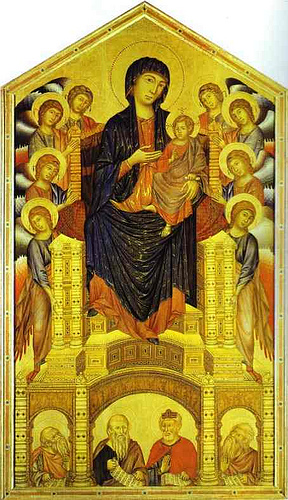 White is the color of holiness and purity (as it is to this day) while the gold is for royalty – Mary is, underneath, a queen – THE Queen, when painted onto the gold field of Heaven. 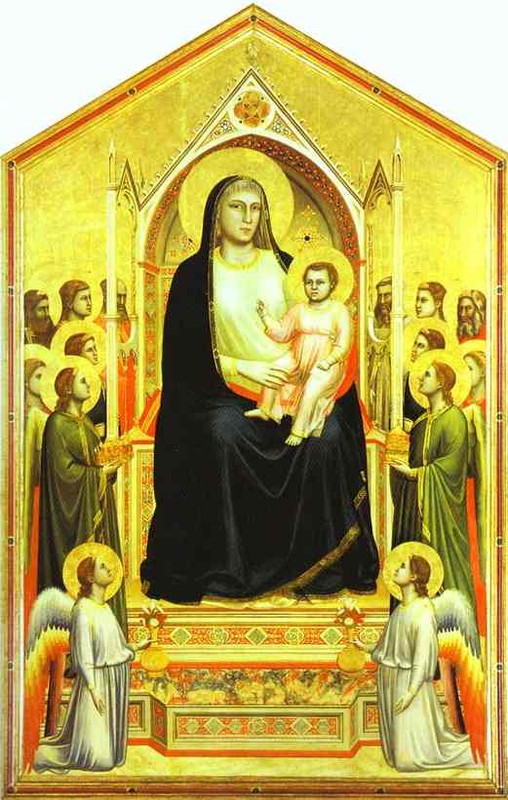 Giotto is emphasizing a different aspect of Mary, but again, this would have been transparent to his contemporaries. 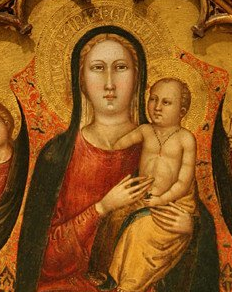 (I’d bet the Christ Child’s robe was originally bright red or at least rose, but faded over the last 700 years. It would be just too weird for Giotto to have painted Him in pink.) Giotto’s innovation is in giving weight and reality to the figures – as far as the iconography goes, he’s completely conventional. The key point here is that the Italian artists, even one as innovative as Giotto, still stuck with the inherited conventions – and largely continued to do so for another couple of centuries. When exploring possible variations, the artists were still very conscious of how their audiences would interpret any departure from tradition. It would be almost unthinkable, for example, to show the Christ Child dressed in green – everyone would want to know what you meant by it. Indeed, an artist knew that every feature of his work would be evaluated in light of Tradition. El Greco was famous (infamous?) for taking liberties with color, yet here he takes a few liberties with the composition, but keeps to the traditional color schemes for Mary. I wonder what his contemporaries thought of the angel in green? Not too common in earlier images, but by 1600 an artist had quite a bit of liberty with portrayals of angels. Returning to Christ grabbing Mary’s veil – the only point I’ll argue with any conviction here is that it is more than just a nice touch of realism. 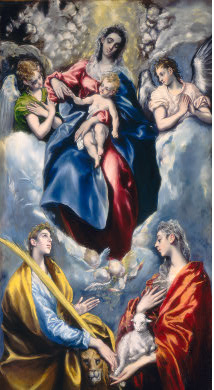 I like the idea that, just as Mary is shown, by the use of blue, red, white and gold, as the hidden Heavenly Queen awaiting her glorification, having the Christ Child hold her veil indicates by Whom her glory will be revealed. Disclaimer: I’m just some guy who took a bunch of art and iconography classes a quarter century ago, so grain of salt an all that. Next Next post: Taking the well-schooled to school.